Similarities, comparisons and parallels can be drawn between extraordinary entrepreneurs and peak performers in almost any athletic competition. 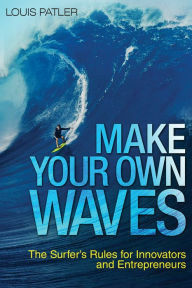 In this book, Louis Patler offers “The Surfer’s Rules,” 10 lessons in conventional wisdom “that will serve as a guide to anyone seeking to be a successful entrepreneur.” Whatever the number and nature of the appropriate lessons may be, the fact remains that peak performance requires “planning, preparation, and passion” to contend with the waves encountered but also the ability to create one’s own waves with which others must contend. In this context, I reminded of Ralph Waldo Emerson’s observation: “Do not go where the path may lead, go instead where there is no path and leave a trail.” Some do. Most don’t. That’s true in surfing and it’s also true in the business world.